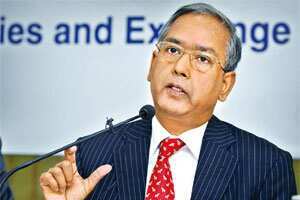 U.K. Sinha, chairman of the Securities and Exchange Board of India (Sebi), said on Tuesday that he is uncomfortable with the ways some companies are raising capital from the markets. There exists a compelling need to strengthen the compliance culture among market intermediaries, Sinha said at the third annual capital market summit organized by the Confederation of Indian Industry (CII). “We are conducting a complete review of the initial public offering (IPO) and primary market processes. We want to make capital raising more efficient in terms of both time and cost. For that, let me alert you that there will be some obligations for the intermediaries. There will be introspection and be ready for it," he added. Sinha said Sebi has just submitted its recommendations for IPOs by non-life insurance companies and inputs are awaited from the Insurance Regulatory and Development Authority, or Irda, the insurance industry watchdog. The Sebi chief urged companies and market intermediaries to address investor grievances fairly and rapidly. Sinha said the regulator had received inputs about a disproportionate number of orders in dispute resolution going in favour of intermediaries and not investors. “If the exchanges are indeed working fairly the investors may not have been communicated the risks and the products well before they participated," Sinha said. “We have received inputs from high networth individuals, but even they feel frustrated. A single disgruntled investor can affect hundreds of investors. So there is a need to strengthen the compliance culture significantly. For this the focus of the senior management among the intermediaries is lacking." The market regulator raised serious concerns about technology introduced recently in the market for algorithmic and high-frequency trading. “In the context of technology and high-frequency trading, there are areas of worry," Sinha said. This assumes significance in the backdrop of a recent failure of risk-management systems that led to the cancellation of trades worth at least Rs25,000 crore on the derivatives platform of BSE. A glitch at a Delhi-based brokerage led to artificially high volumes on the bourse during muhurat trading last month. Sebi is investigating the issue and has met officials from both BSE and the National Stock Exchange (NSE) on the matter. “We are not banning this product but we are going to be very careful," Sinha said. “We have to see if this sort of trading is creating any bias against retail investors." The market needs better retail participation, said Chitra Ramakrishna, deputy managing director of NSE, India’s largest exchange. The “challenge is to increase retail participation in our markets," she said. “We need simpler and safer products for retail investors." Sinha agreed. Sebi will be cautious in clearing new products if they are perceived to be risky, he said. While launching new products to deepen the capital market, issuers and intermediaries such as stock exchanges should assess the risk appetite of investors, he said. Sebi recently allowed mutual funds to mobilize money from infrastructure debt funds. This is in line with government efforts to improve support for the country’s infrastructure growth. The regulator is also working on final guidelines for alternative investment classes such as private equity and venture capital, and regulations for distributors and financial advisers. The agency issued separate draft regulations for both alternative investments and financial advisers a few months back. Sebi has received strong criticism from the industry to these, Sinha said. Under the proposed rules, Sebi aims to categorize funds according to the sectors they raise money from. This has been criticized by industry experts. Also, foreign funds in the private equity and venture capital business are unhappy with the draft rules because they do not want Sebi to intervene in the process of raising funds from foreign investors. Sebi said the intention of the regulator had not been understood by the industry. “We will intervene only where the money of domestic investors is involved. Secondly, as far as sector-wise classification is concerned, there are certain sectors in India where the government offers certain concessions and incentives as a matter of the policy. If a fund wants to benefit from such concessions and incentives then it should stick to the mandate. If you want to raise funds from other sectors then we have to intervene and protect the interest of investors," Sinha said. Sebi will release the final guidelines on alternative investment funds in the next two months. The regulator has also attracted criticism on the draft rules for investment advisers. “The government has been working on this. There is a concern over conflict of interest due to overlap of jurisdictions on products and services. We are working on ways to clearly categorize products and services according to the regulators. It’s a complicated issue but we are moving," said the Sebi chairman.